So you’ve identified a need for some sort of sales support? You’ve had a meeting and decided that a professional appointment setting company is required to feed the field team. You’re trying to determine whether an in-house solution would be preferable to outsourcing and so are trying to get a handle on both in order to compare. You have a whole bunch of data that needs cleansing. If any of those sound familiar… Don’t spend another penny on telemarketing until you’ve read our essential guide. 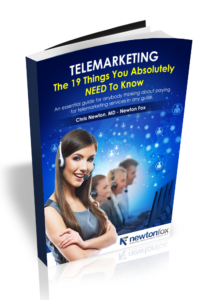 It’s packed full of signposts, tips and tricks to help you not just avoid the pitfalls but help illuminate your path to a successful telemarketing solution, whatever that may be. Just fill in the form below to receive a free copy, instantly!